What impresses one about the music of Gregory D’Alessio is not merely his technical command of his craft, which is formidable, but his willingness to dare, to strike out on his own path. 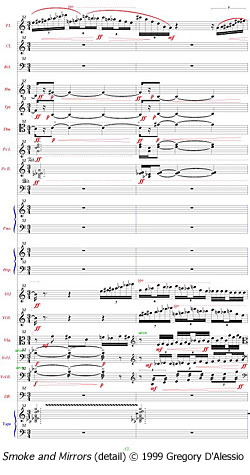 The sounds this composer creates are exceptionally fascinating, whether produced by electronic means or with conventional instruments, or in some combination of the two. One always senses D’Alessio’s passionate involvement and his desire to communicate expressively. In pieces like Veil for flute and string trio and Smoke and Mirrors for chamber orchestra and tape, D’Alessio shares with his listeners not merely the musical problems and challenges he has set for himself but his solutions; not what he was looking for, but what he has found. He seems to have taken on the challenge of conveying emotions through abstract shapes. Listening to this music, one is put in mind of architect Frank Gehry and his desire to create “forms and materials that have passion in them,” making passers-by feel they are “in a new environment, a new realm.” The Cleveland Plain Dealer found Smoke and Mirrors (performed by the Cleveland Chamber Symphony) “full of cataclysm and majesty in equal measure.” Especially impressive and affecting is D’Alessio’s Piano Trio, which speaks with almost romantic fervor. 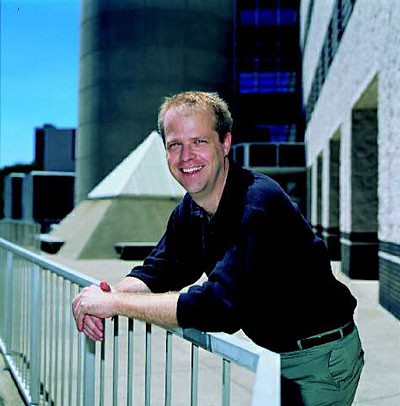 An assistant professor of composition at Cleveland State University, where he also serves as coordinator of the electronic and computer music program, Gregory D’Alessio earned his master’s and doctor’s degrees from Columbia University, where he studied with Mario Davidovsky, Fred Lerdahl, Arthur Krieger and George Edwards. Clearly a young composer of great promise, he was accepted for further studies by such leading creative figures as Milton Babbitt, Louis Andriessen, Jacob Druckman, Andrew Imbrie, Bernard Rands and Chinary Ung. In addition to composing and teaching, he is co-founder and editor of New Modern Music, an on-line magazine dedicated to contemporary music. Prior to joining the CSU faculty, he was on the staff of Opcode Systems, a major producer of music software and technology. 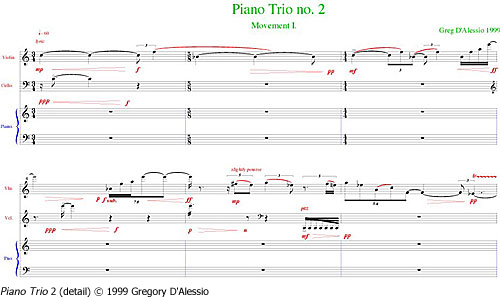 D’Alessio has won numerous awards and grants, including a Guggenheim Fellowship for 2001–2002, an Ohio Arts Council individual artist award, and the Board of Directors Prize from the Society for Electro-Acoustic Music (SEAMUS); fellowships to the Berkshire Music Festival at Tanglewood, Aspen Music Festival, Wellesley Composers Conference and Idaho’s Sandpoint Festival; and residencies at the MacDowell Colony, the Virginia Center for the Creative Arts and the Atlantic Center for the Arts. His works have been performed at conferences of the Society of Composers International (SCI) and the Society for Electro-Acoustic Music. Such noted ensembles as Speculum Musicae, the New Millennium Ensemble, the Manhattan Wind Quintet, the Tanglewood Contemporary Music Ensemble and the Cleveland Chamber Symphony have programmed his compositions to audience and critical acclaim. D’Alessio has also served as visiting composer at the University of Illinois at Chicago and the University of Wisconsin Madison. His music is available on CD from the Society for Electro-Acoustic Music US.